This machine was HORRIBLE! I purchased it to use in my café I'm opening and had a professional coffee shop owner help me with it and it won't provide enough pressure to push even 1 ounce of espresso thru. Now, I'm running around trying to find an ACTUAL espresso maker that can arrive in time for opening. VERY BAD purchase! Kitchen Goods, a unit of Dominant Systems Corporation, uses sophisticated crawler software to search the web looking for great product deals online. For this page, related items include products we find that match the following keywords: "Espresso Machine,3,4|Espresso,5,6,7" at our vendor partner Walmart - Click More Info / Buy Now to check for price rollbacks!. 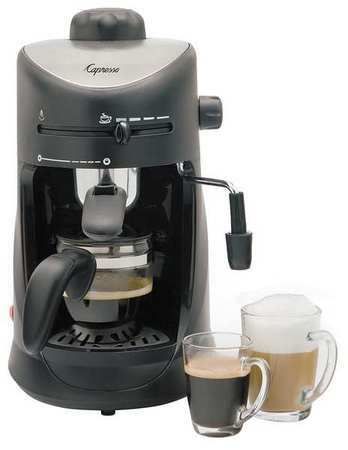 CAPRESSO Espresso Machine,Black Silver,10 oz. 303.01 is one of 115 Espresso Machines and related products available for sale through Kitchengoods.com, If you have any questions on this product, please give us a call at 734-971-1210 during the hours of 9am - 5pm EST for assistance. Thank you for shopping at Kitchen Goods, your place for kitchen gadgets, and more!